1N4005 diode. Also replaces 1N4001, 1N4002, 1N4003, or 1N4004. 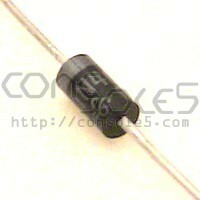 Single 1N4005 diode. Higher-rated substitute for 1N4001, 1N4002, 1N4003, and 1N4004.